A colorful painting scheme was designed by our artists to liven up the walls. 1950’s artwork theme throughout the room. School mascot logos inlaid in tabletops. Half-walls divide the room and cozy booths along the outer walls. 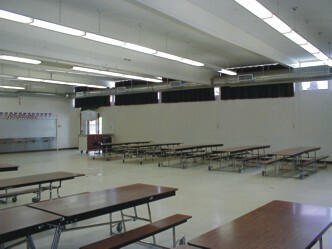 Before: You know, this probably looks a lot like the cafeteria in your school — long, institutional folding tables in a room with bare white walls. 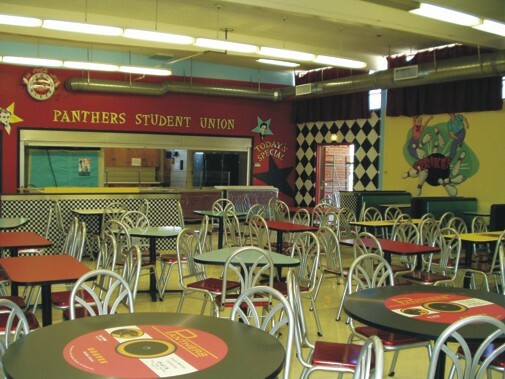 After: We branded the room as “Pathers Student Union” with 1950’s theme art and 45 rpm record graphic tabletops. All the chairs are stackable and these stylish pedestal tables can be easily moved for multi-purpose room uses.